Despite yesterday’s market sell-off, the Fed is still on track to raise interest rates in June. Wednesday’s action is no more than a speed bump for the Fed. It will not stop the Fed from moving forward with another 0.25% rate increase. The Fed is embarking on a new path, a path that started several years with QE (quantitative easing). QE is the name for the method the Fed uses to ease monetary conditions when interest rates are already zero. Conventional monetary policy calls for interest rate cuts to stimulate growth and inflate asset prices when the economy is in a recession. What does a central bank do when interest rates are already at zero and you can’t cut them anymore? One solution is negative interest rates, although the evidence from Japan and Europe indicates that negative rates do not have the same effect as rate cuts from positive levels. The second solution is to print money! The Fed does this by buying bonds from the big banks. The banks deliver the bonds to the Fed, and the Fed pays for them with money from thin air. The popular name for this is quantitative easing, or QE, although the Fed’s technical name is long-term asset purchases. The Fed did QE in three rounds from 2008 to 2013. They gradually tapered new purchases down to zero by 2014. Since then, the Fed has been stuck with $4.5 trillion of bonds that it bought with the printed money. When the bonds mature, the Fed buys new ones to maintain the size of its balance sheet. But now the Fed wants to “normalize” its balance sheet and get back down to about $2 trillion. They could just sell the bonds, but that would destroy the bond market. Instead, the Fed will let the old bonds mature, and not buy new ones. That way the money just disappears and the balance sheet shrinks. The new name for this is “quantitative tightening,” or QT. You’ll be hearing a lot about QT in the months ahead. QT is now replacing quantitative tightening. The Fed wants to start shrinking its balance sheet by letting the bonds mature, receiving the cash and not reinvesting. That way the balance sheet shrinks and the money just disappears, as I described. Essentially, the Fed is putting QE in reverse. This is part of the Fed’s effort to get interest rates and its balance sheet back to normal in the aftermath of the 2008 financial crisis. Right now, the Fed’s target interest rate for fed funds (the so-called “policy rate”) is 1%. The Fed’s balance sheet is at about $4.5 trillion, as stated. Using the Taylor Rule and the pre-crisis trend line, a normal Fed at this stage of an expansion would probably have interest rates at about 2.5% and a balance sheet of $2 trillion. The Taylor Rule is a formula suggesting how the central banks should alter interest rates in response to changes in economic conditions. Created by economist John Taylor, it’s designed to adjust short-term interest rates to stabilize the economy, while still allowing long-term growth and inflation goals. Basically, it suggests a fairly high interest rate when inflation rises above the target or under conditions of full employment level. Conversely, the Taylor Rule suggests a fairly low interest rate when the opposite conditions prevail. As you probably know, the Fed is far from normal today. Interest rates are on track to hit 2.5% by late 2018. The balance sheet might hit $2 trillion by 2020. We’re still a few years away from normal. Meanwhile the current economic expansion is eight years old next month, one of the longest in history. Here’s the problem. The Fed spent eight years telling us that QE would “stimulate” the economy, create a “wealth effect,” and save us from depression. Now they’ll want to say that QT is no big deal and not affect the economy at all. For example, Bill Dudley, President of the Federal Reserve Bank of New York, believes that QT can be done gradually and can “run in the background” without disrupting markets. The Fed’s decision not to buy new bonds will be just as much a form of tightening as raising interest rates. How come it’s stimulative when they print money, but it’s not contractionary when they make money disappear? The argument contains a basic contradiction. The contradiction leads to two results. One is that the Fed is engaged in happy talk and wants us to believe QT is not contractionary when it is. The other is that QT actually is contractionary, and we’ll be in a recession sooner than later. Unfortunately, both things are true. The Fed operates on a theory that it’s better to clean-up the mess after an asset bubble bursts than it is to try to deflate the bubble in the first place. This theory is based on an incorrect reading of history and a deficient understanding of the dynamics of systemic risk. The “clean-up theory” started with a study of the Great Depression by Milton Friedman and Anna Schwartz in their book A Monetary History of the United States. The U.S. stock market was clearly in a bubble in 1927 and 1928. But the U.S. was also receiving gold inflows because of a U.S. trade surplus. 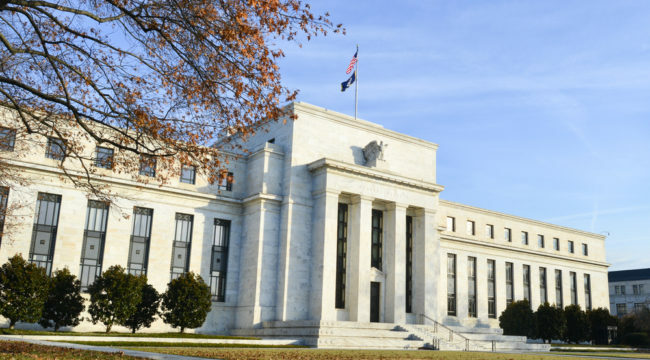 Under the monetary standard at the time, the Fed should have eased monetary policy. Instead they tightened policy to deflate the stock market bubble. The tight money policy led to a stock market crash that caused the Great Depression. Alan Greenspan applied the “clean-up theory” again during the dot.com bubble of 1996-2000. Greenspan could see the bubble as early as 1996 and said so in his “irrational exuberance” speech. But he did nothing to deflate it. Once the bubble burst in 2000, Greenspan supplied easy money to prevent the stock market crash from turning into something worse. Based on the experiences of 1929 and 2000, the Fed has now embraced the clean-up theory. As a result, the Fed does nothing to stop asset bubbles from growing. But markets do. So, what happens if the Fed tightens too much too soon in a weak economy and causes a recession before they can normalize? The first thing they would do is stop QT. The next thing they would do is to cut interest rates. At that point, the Fed is in danger of hitting a zero rate again before the recession is over. That’s what happened in 2008. What then? Well,the Fed has an answer. It’s back to QE! You can call it QE4 or QE1 part 2, or anything you like. The point is that the Fed has trapped itself into perpetual manipulation of markets. There’s no escape from this giant experiment in unconventional monetary policy — dreamed up by academics like Ben Bernanke and Janet Yellen, who don’t understand real world economics. For now, look for QT. But in the next recession, possible soon, look for the return of QE. Here’s the takeaway: The Fed can bail out the stock market or the big banks when needed, but they’re not coming to bail out you and me. We need to look out for ourselves. So this is a great time to increase your allocations to cash, gold, silver and U.S. Treasuries. What you give up in yield will be more than made up by avoiding losses and being able to shop for bargains when the correction comes. These are your best forms of insurance against the coming crash.